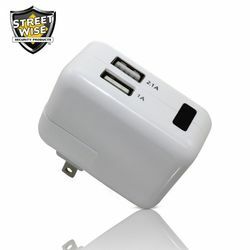 USB block chargers are a common household item in this age of electronic devices. 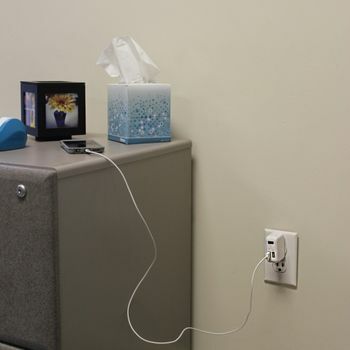 We need them for charging laptops, smartphones, tablets and more. 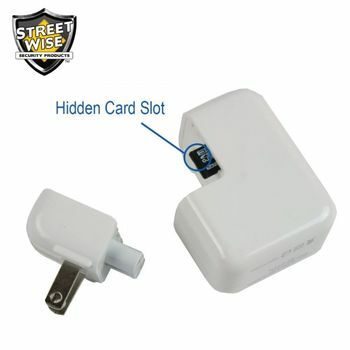 So what better device to house a hidden spy camera & DVR than a USB block charger? 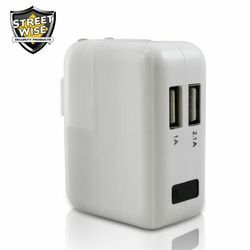 Inside this functional USB block charger is a 1080p HD enabled camera & DVR that can record hours of hidden footage in one of two recording modes: motion detection or continuous. All videos are saved to an included 8GB microSD card, which can be upgraded up to a 32GB card (not included, see accessories). The camera also allows you to set a time and date, so you always know when something took place. To view your videos, simply connect the charger to your computer with the included USB cable (supports Mac OS, Android, and Windows systems). Lastly, this spy camera does not require batteries, but plugs into any standard outlet. Dimensions: 2.25" x 1" x 1.75"